Lepakshi is a small village located about 120 kms from Bangalore and 110 kms from Anantapur in Andhra Pradesh. Situated in the Anantapur district, Lepakshi is a historically and archeologically significant village. Lepakshi is famous for the 16th century Veerabhadra Temple built in Vijayanagara architectural style. Every year thousands of tourists visit this place from all over the world to watch the wonder of hanging pillar located in the famous Lepakshi temple. The hanging pillar which is one of its kind in the world is sight to marvel at. Besides the hanging pillar, a huge structure of Nandi sculpted out of a single granite stone holds the attention of the visitors. Nandi bull made out of monolithic granite stone believed to be the largest such Nandi anywhere. The giant Nandi is situated next to main road around 200 meters from the Veerabhadra Temple. There is a lot of history and architecture around this small village. One such example of extraordinary architecture and history is the Veerabhadra Temple which houses numerous mural paintings of the Vijayanagar kings, and inscriptions dating back to centuries. This town is 450kms from Hyderabad and 130 kms from Bangalore. While visiting this town, take time to visit nearby silk weaving centers for a taste of local art. There are no stay options at Lepakshi and the nearest accommodation is available in Hindupur, 15 kms from here. The weather in Lepakshi remains pleasant for the most part of the year except for in summers when it can become exceedingly hot. Lepakshi does not have proper accommodation options. Hindupur is the nearest town where you can find hotels and guest-houses. 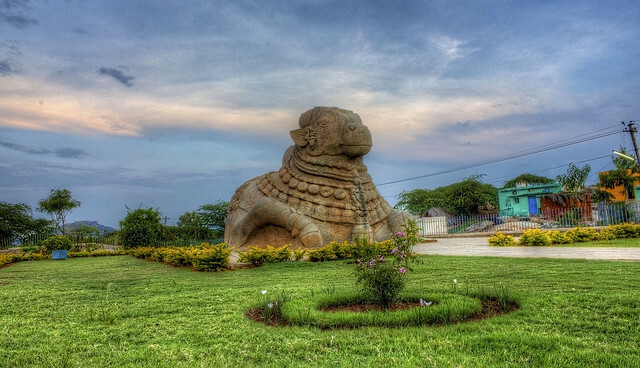 Visit Lepakshi for the largest monolithic Nandi. Its a sight to behold.